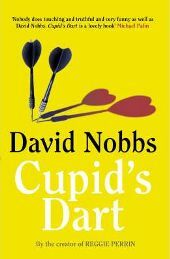 Cupid’s Dart by David Nobbs contains Great British social humour, which I found very entertaining. David Nobbs is also the creator of Reggie Perrin, along with many other comedy works in the form of novels, as well as TV and radio scriptwriting. Before earning his living as a writer he was in the army, a journalist and an advertising executive. Born in Kent, and now living near Harrogate, he is adept at bringing eccentric British personalities sharply to life. He has obviously mastered the technique of “people-watching”. I especially like the fact that, despite poking fun at his characters, readers will often grow to like them, as the reasons for their behaviour become apparent. I had high hopes for Cupid’s Dart, his most recent novel, and was not disappointed. The leading male character had enough personality similarities with the author’s most famous creation, Reggie Perrin, to make me think that it may have been how he would have turned out, if he had chosen a purely academic life. I now think of this character as Reggie’s cousin – initially usually fitting the role in the world in which he lives, but with a crazy, perhaps menacing, alter ego trying to get out. In this novel the author brings together two very different types of people. Alan Calcutt, from whose viewpoint the story is narrated, is an Oxford University Philosophy Don, who has a chance meeting with Ange, an Essex Girl. They are fascinated by each other, and the friendship that follows teaches them both a lot. The Essex girl widens her general education, while the Don learns much about social skills as well as Ange’s hobby, which inspired the title of the book, darts. Once Ange has learnt the basics of philosophy and applies them to ordinary things, the Don realises how much he hasn’t thought about them. One thing they find they have in common is that they have both believed good things about people they love, because they wanted them to be true, not because they are. Alan’s example is quite mundane, but imaginative Ange has more interesting fantasies. I particularly admired Ange’s self confidence, at least partly inspired by the sense of fun which comes out when meeting people from the Don’s walk of life. If they had taken the time to know her properly, would they have come to the same conclusions about her? Are they as clever as they think they are? That is for individual readers to decide. I found this a very amusing read, the main humour being at the expense of the academic middle classes, darts fans and the Essex girl stereotype. As a female who has lived in Essex for many years, I didn’t take a fence (or even offence), because I thought the humour came from observation rather than prejudice. Particularly appealing to my sense of humour was the murderous fast paced, sub-plot near the end, because of the contrast it had to the main reconciliation storyline. I can think of just one thing against reading this book: as this is a Great British funny novel, I am not sure if other cultures would fully understand the humour. So much is incorporated into this satirical man meets girl story, that although the primarily category for this book is humour, the themes of romance, travel (Rome, Prague, London, Oxford, the industrial West Midlands), and of course philosophy, also feature. This makes me believe that it should have wide appeal. Whether readers just think of this as a light funny fictional story, or see extra depths as well, I hope many others will enjoy it as much as I did. No Comments on "Oxford Don Studies Essex Girl"